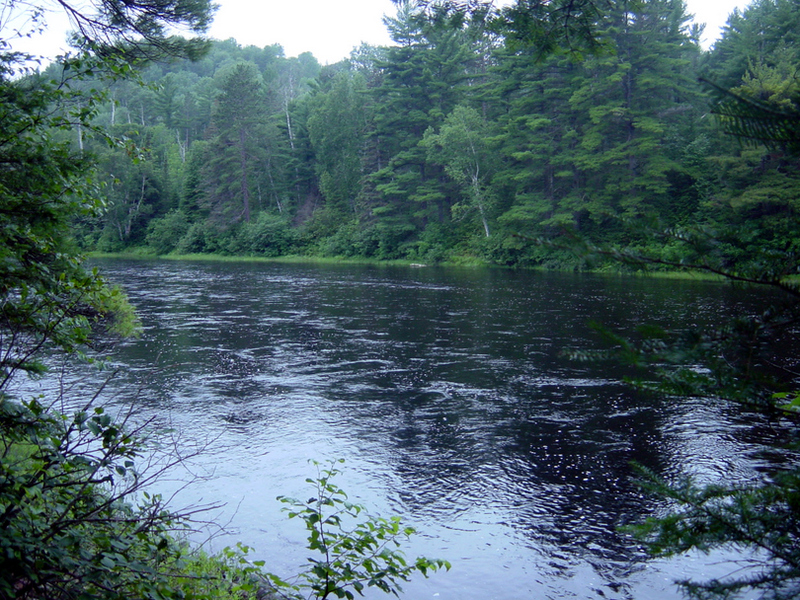 The Spanish River is unique in that it possesses two beautiful branches that merge at the ‘Forks’ north of Pogamasing. Each branch offers something completely different. 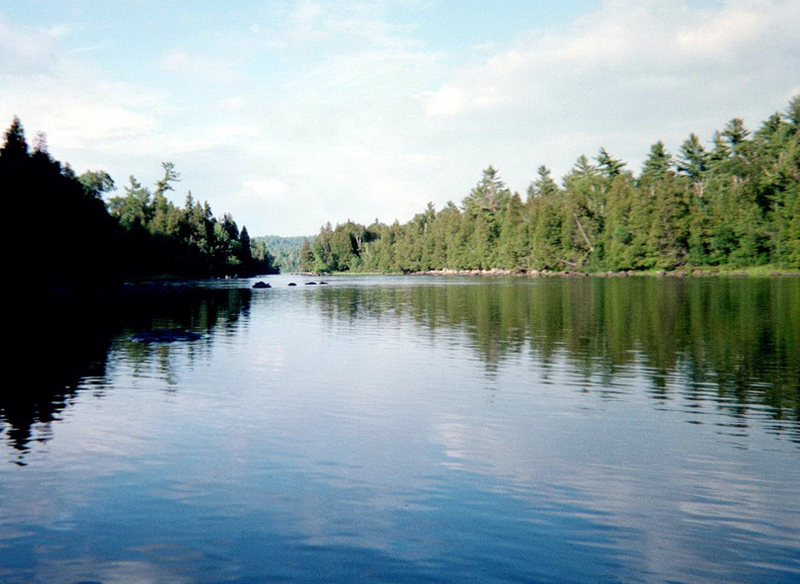 In the upper reaches of the East Branch, there are a number of lakes connected by narrows. 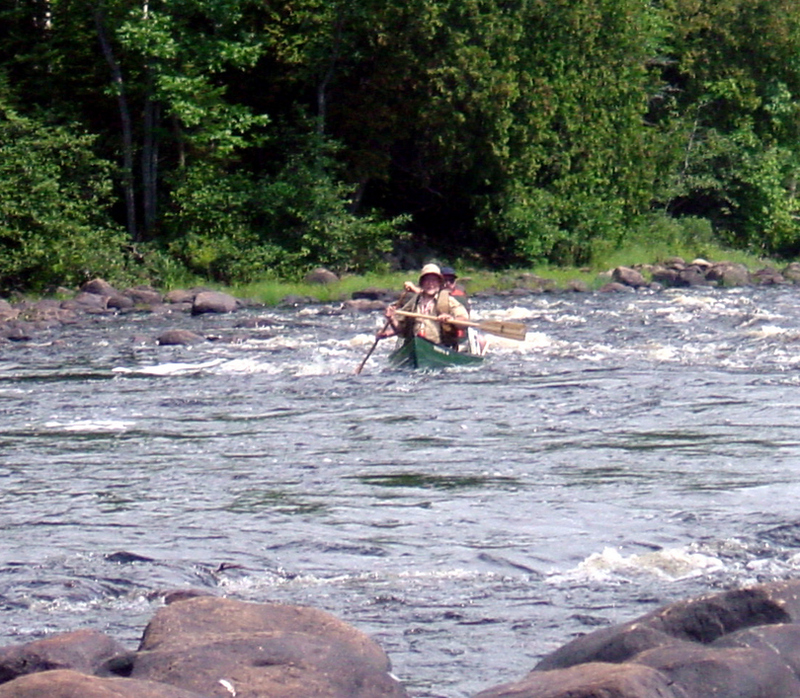 Below The Forks, the river has a series of more or less straight channels with some swift shallow rapids and bends. 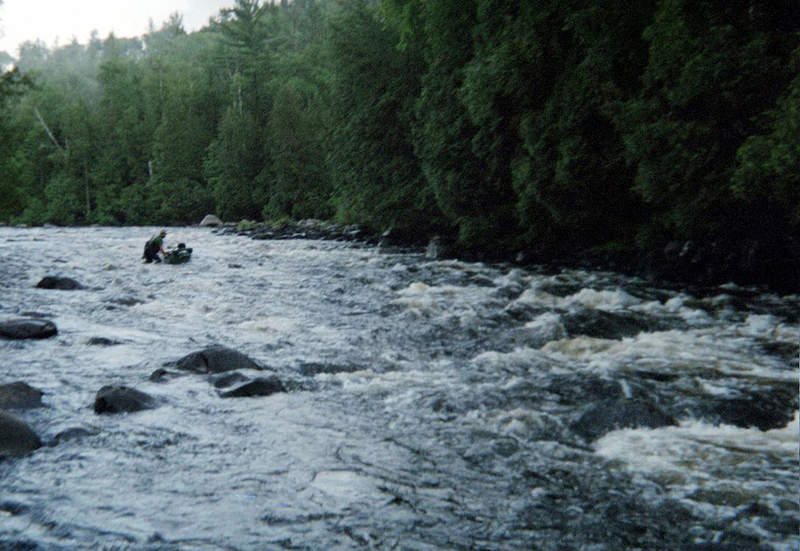 Spanish Lake is a widening of the river, below, numerous swift rapids and bends lead to The Elbow. 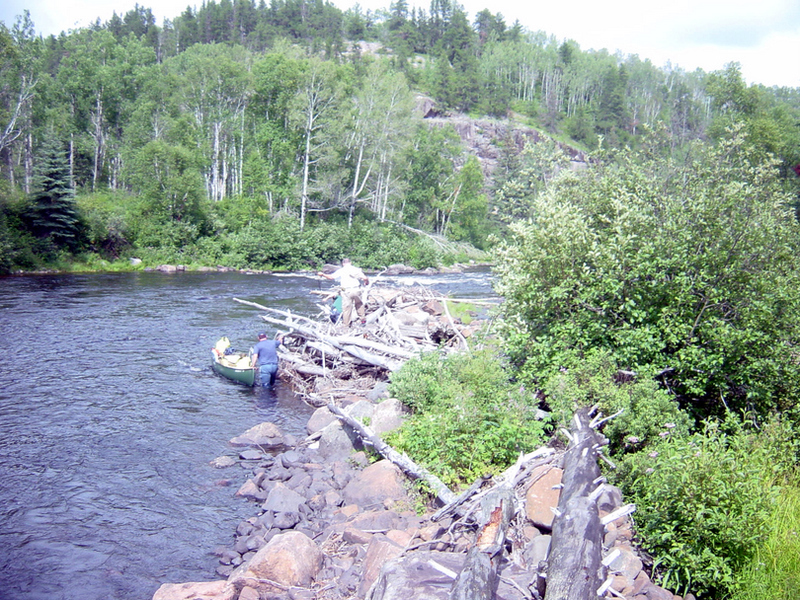 A bedrock ledge forms a two-metre drop in the river at the Graveyard Rapids. 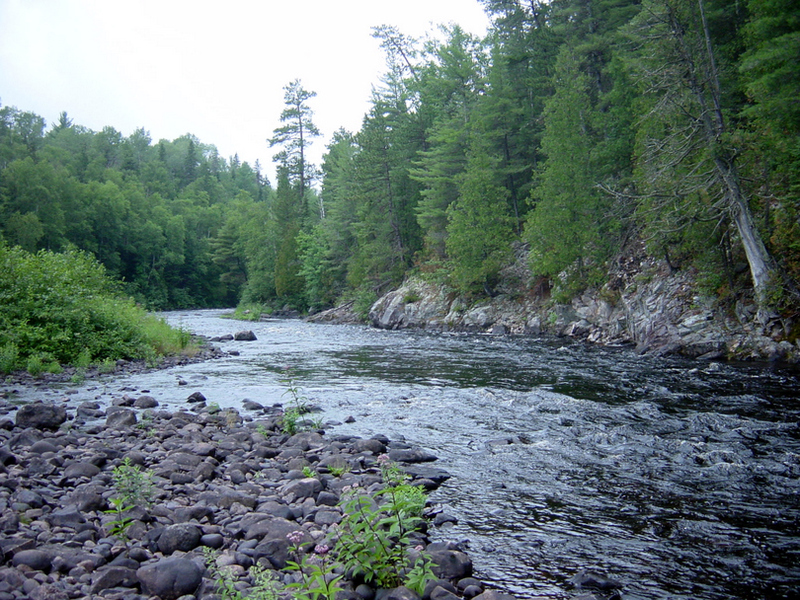 Below these, the river bends with a few shallow rapids but is generally calming to the top end of Agnew Lake. Take chute on right at train bridge (Shehan). Past Pogamasing. South on Spanish River. South through Spanish Lake. P 230 m R around Zig-Zag Rapids (or CBR). South on Spanish River past the Elbow (intermediate road access from Hwy 144). Northwest for 2 km. The Graveyard Rapids, including… P 500 m R around rapids (or CBR first and P 150 m L second), P 150 m L around falls, P 100 m R or liftover at ledge, P 350 m L bouldery rapid at Agnes River (or CBR / line left). West on Spanish River. Shart right turn brings you directly into Cedar Rapids. Line left or CBR (rock at bottom of first set / large standing waves!). South on Spanish River. South through Agnew Lake to finish at Agnew Lake Lodge. 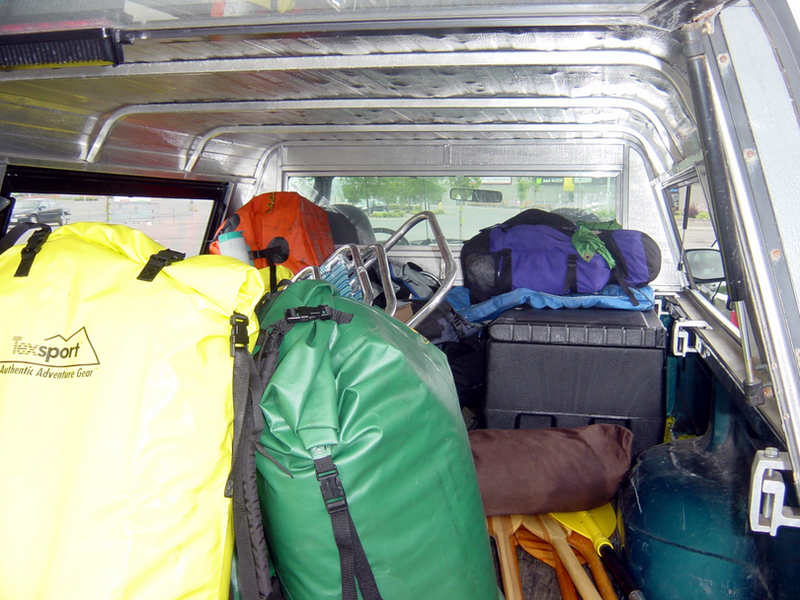 Bob, Steve, and I met at Skip’s house where we loaded all our gear into the back of my truck. 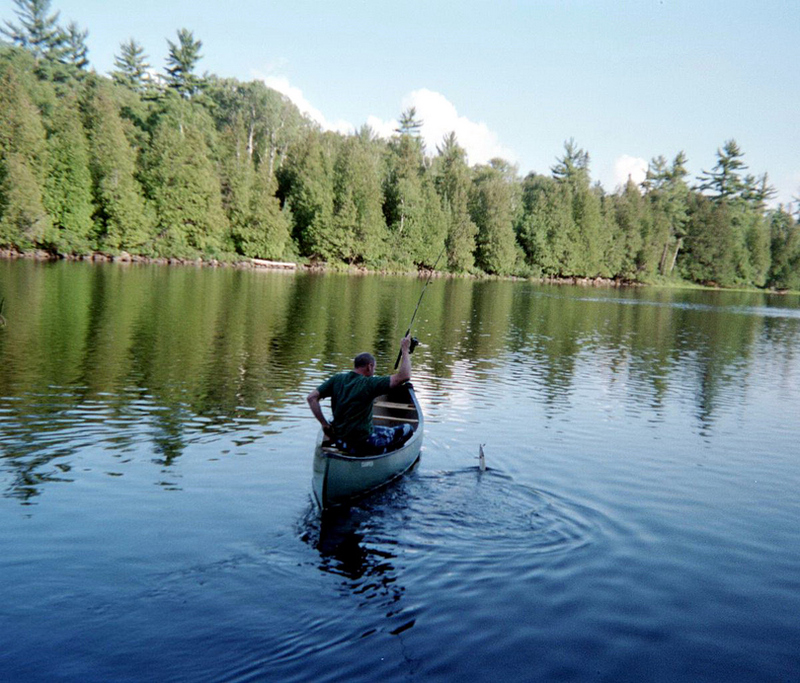 Steve and Skip’s canoe went on top. Bob & Skip rode in Skip’s Subaru while Steve and I rode in the truck. Eleven hours and 570 some miles later we arrived at Agnew Lake Lodge where we camped for the night. The next day they provided a car shuttle to Duke Lake and returned the truck to the lodge where we planned to arrive six days hence. We launched on Duke Lake late morning. 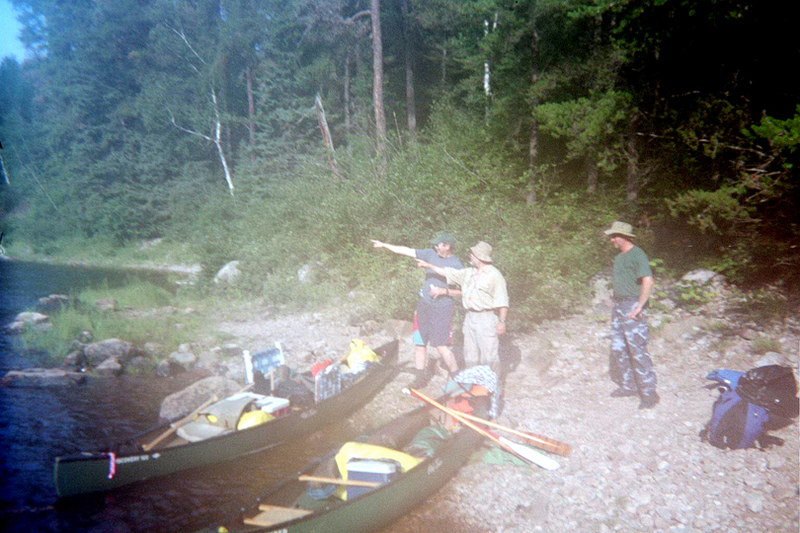 With all the gear and coolers the canoes were packed to the gunwales. We were not aware of the Canadian custom of having a three day weekend the 1st Monday of every summer month. Because of the holiday we saw several other canoes during day 1. The campsites were well spread apart and mostly occupied. As the late afternoon approached we got serious about finding a site. 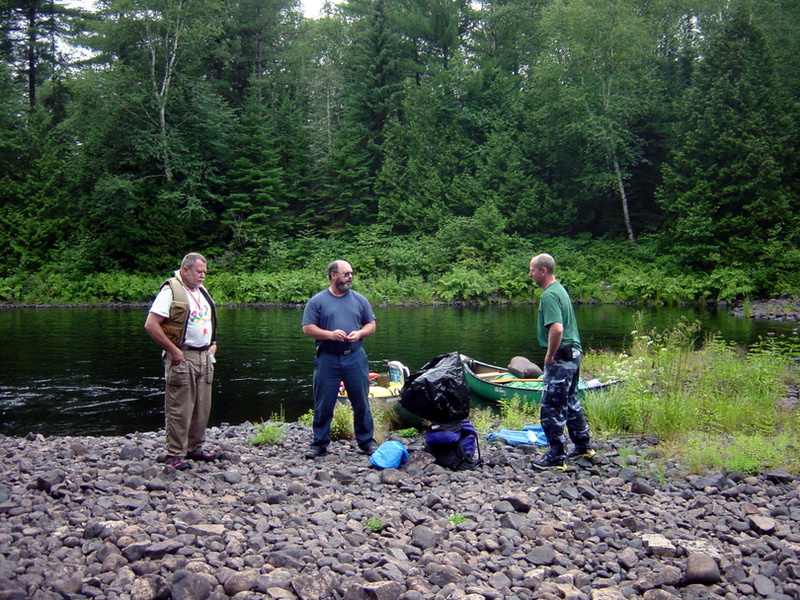 We passed a small group that had taken a break at a portage and kept our pace finding a nice site shortly after. 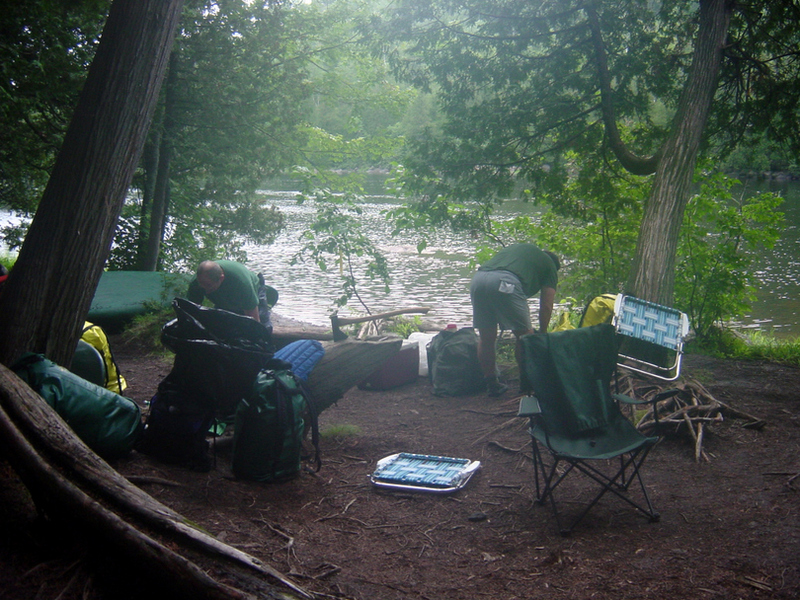 The small group caught up to us after we had picked tents and we could hear the disappointment in their voices as they found the campsite occupied and themselves facing another hour (or more of paddling). Below Skip and Bob re-hydrate at the end of day 1. Steve tries out the fishing. During the day as we passed other campers we had engaged in quick conversations. 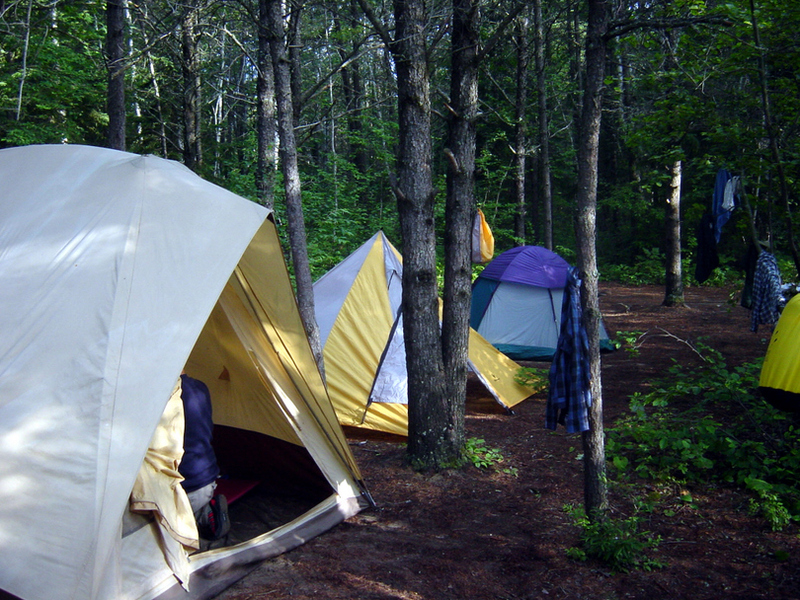 One of the campsites reported that the mosquitoes got fierce at night. We dismissed the claim as the complaints of novices. As we sat around the campsite a little before 9pm we heard a low hum. I announced that I was tired and going to bed as the mosquitoes came out of the woods in force. They were voracious and bit through shirts and pants. 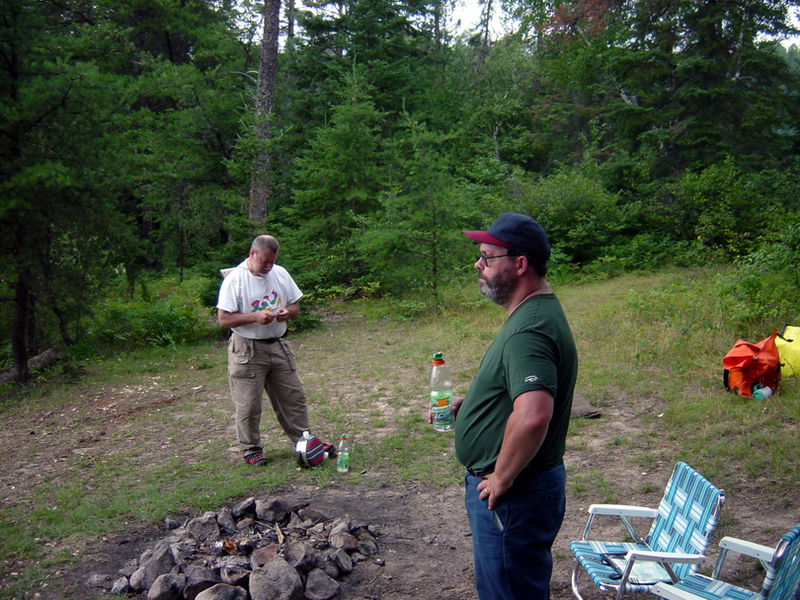 Skip, Bob and I ducked into Bob’s big tent and smashed the few mosquitoes that accompanied us. We typically would paddle for 90 -120 minutes and then pull out to stretch and relax. 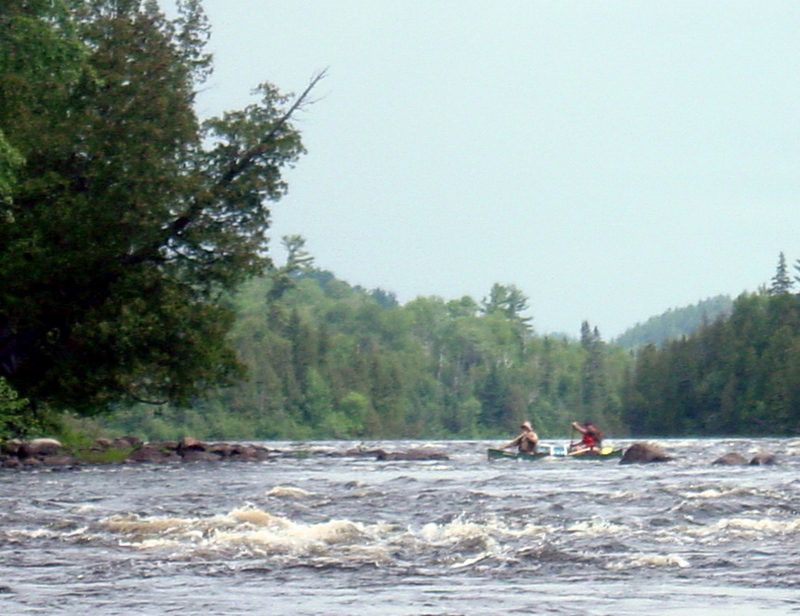 Lining the canoes around Upper Athlone Rapids. There was a nest of hornets somewhere in that woodpile, but we avoided being stung. 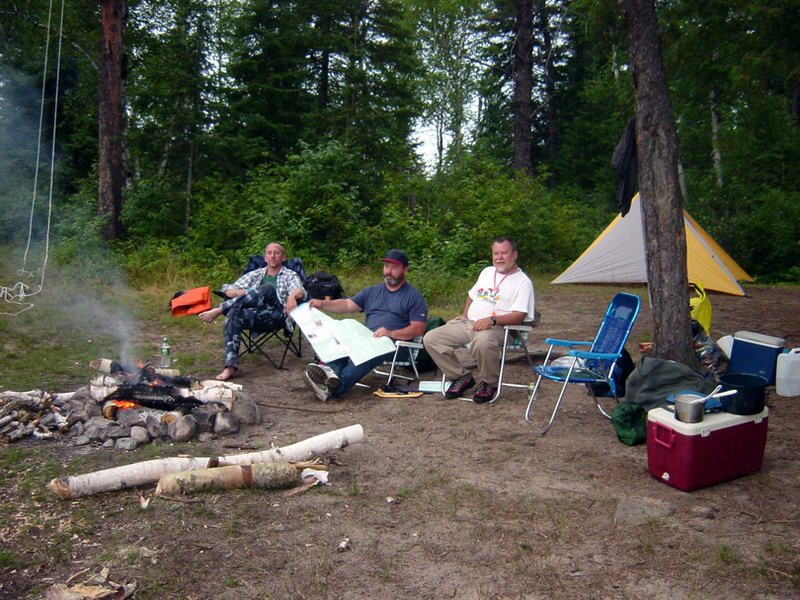 Our normal routine in camp was that Skip & Steve would set up tents, Jim would collect, cut and split wood, Bob would cook and we took turns washing dishes. Below Jim stirs the meal and Skip relaxes in a lawn chair. Jim, Bob and Skip slept in Bob’s “Palace”. 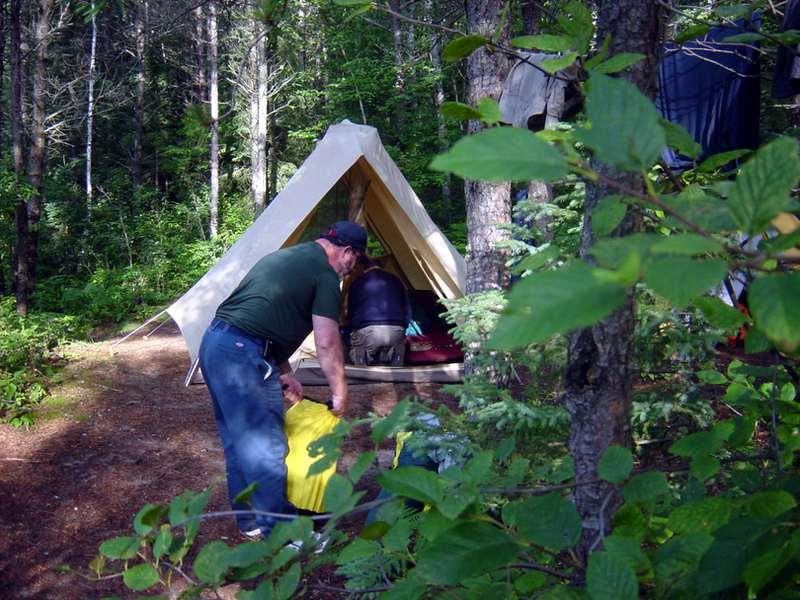 Note the tight pitch of the tent and sturdy tent poles. 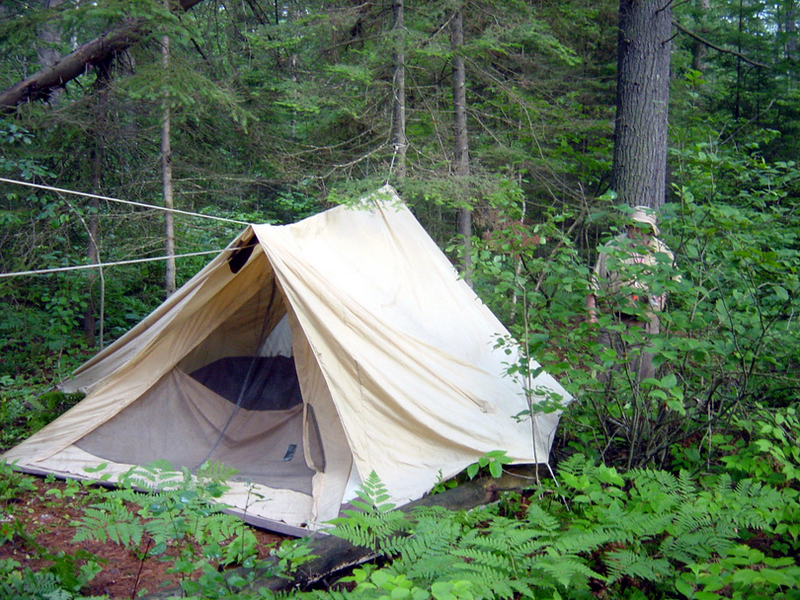 We had the palace, a tipi for our packs and gear and Steve slept in his dome tent. 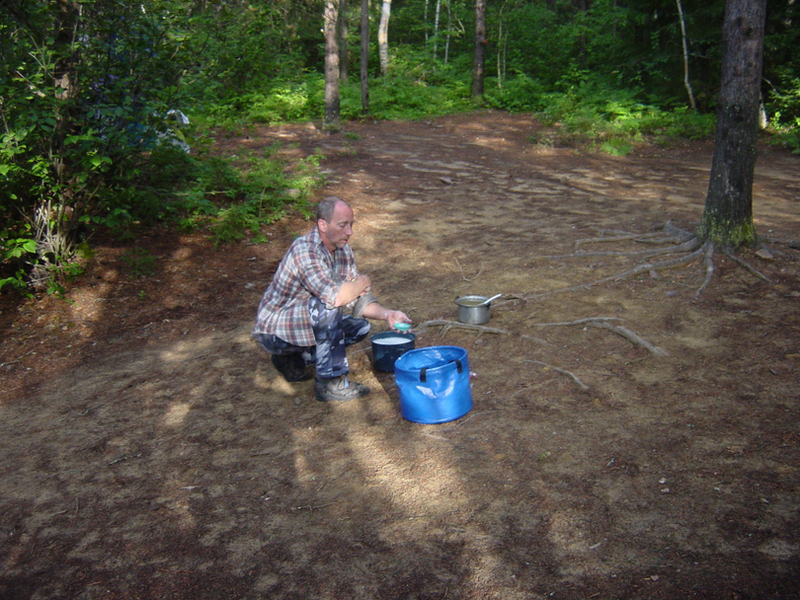 At our camp just below the Upper Athlone Rapids it was Steve’s turn to wash dishes. The next morning we voted on which route to take. It was decided to continue downstream! 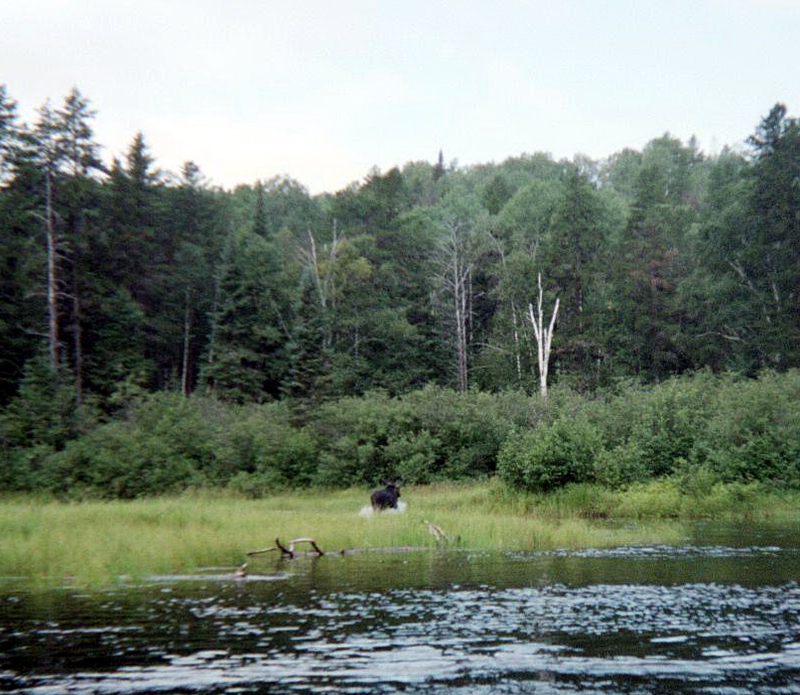 We came upon a moose browsing along the shore. By the time I got my camera out he decided to leave. 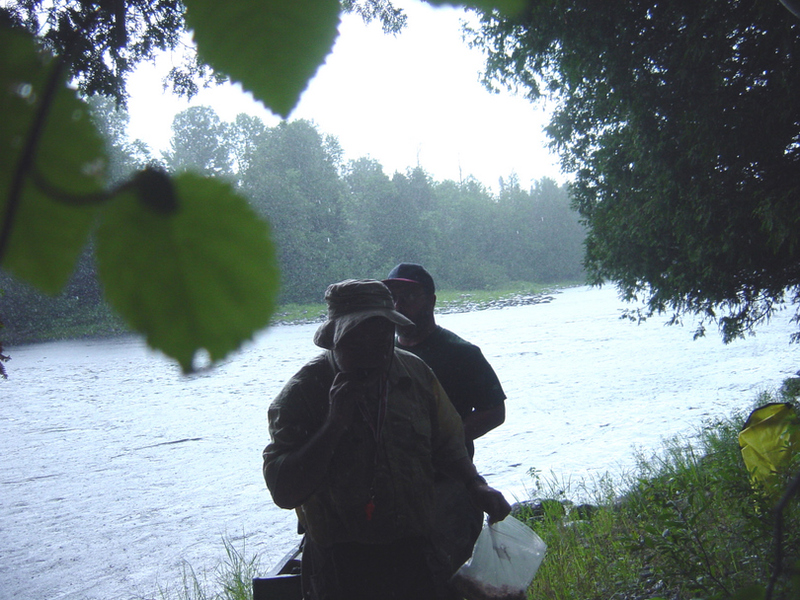 We had rain almost every day, but we were able to set up and break camp in dry conditions. We usually wore the same canoeing clothes each day and changed into dry clothes at camp. 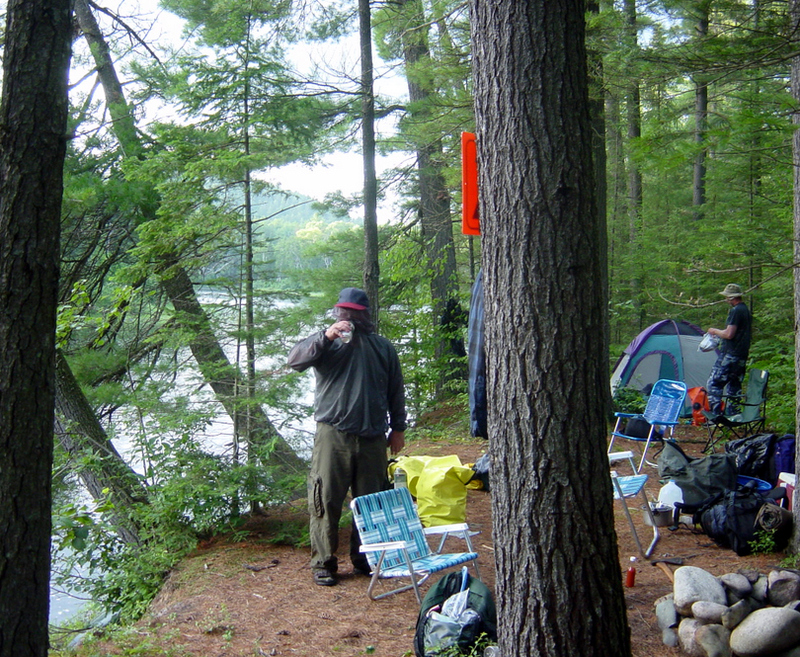 We had a damp camp at Spanish Lake and Steve and Skip dug out dry clothes. Steve went out fishing after dinner and caught a small pike. The next morning the sun shone and the skies were clear. Zig Zag rapids were one of the 1st sets of rapids we encountered. We spent 45 minutes planning our route. 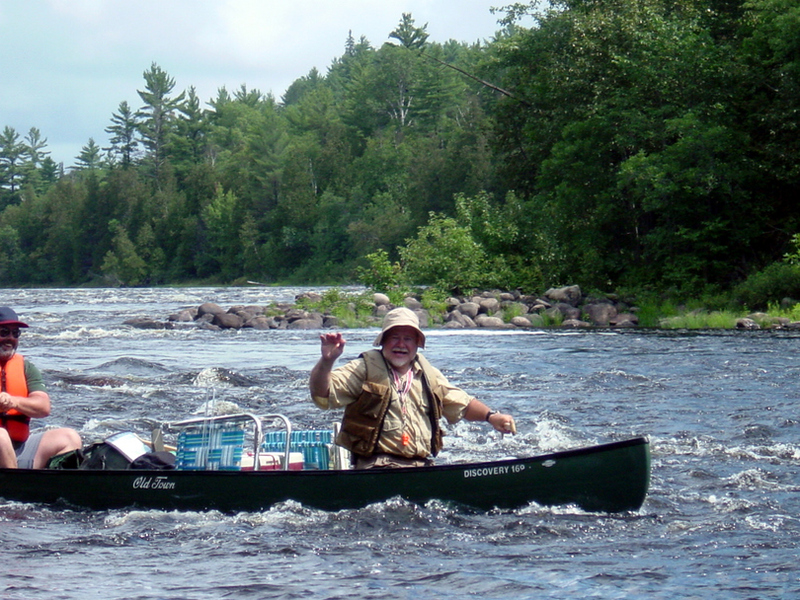 Later in the trip we would give rapids a cursory scout and proceed. Below Bob & Skip run Zip Zag Rapids. We had several downpours during the trip. Sometimes we took a break and sought shelter. Below Bob and Skip seek shelter under the trees where we waited out the thunderstorm and munched on trail mix. Other times we paddled on through the rain. One of the fiercest thunderstorms was made more violent by my unwitting taunt “You call this rain!” – which caused an even more torrential downpour. 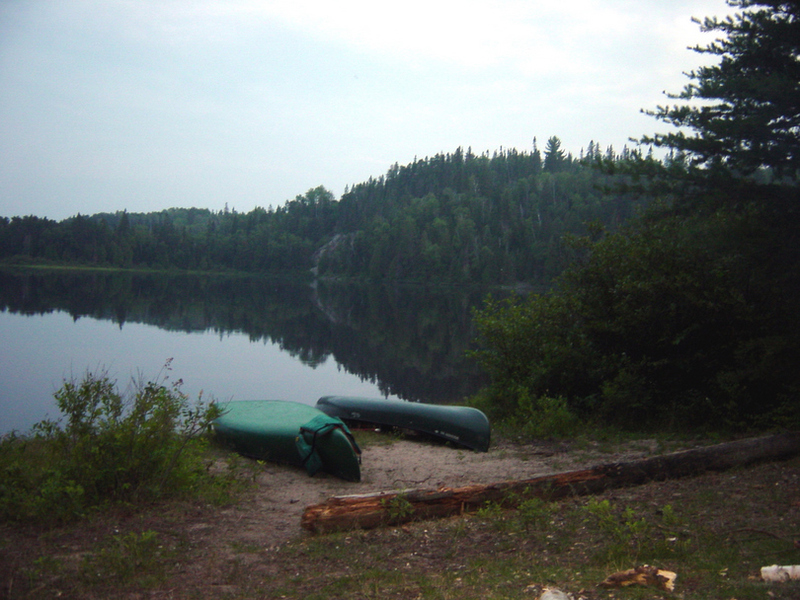 At the portage we inadvertently left the tent poles to Bob’s Palace. Subsequent efforts to pitch the tent required improvisation. We ran Big Agnes rapids. Bob & Skip took on a lot of water, but bounced their way through. Steve and Jim weren’t so lucky and dumped partway through. While Steve and Jim struggled to keep the boat from completely leaving the scene of the crime, Skip showed up not with a throw rope but with a camera to record the moment. 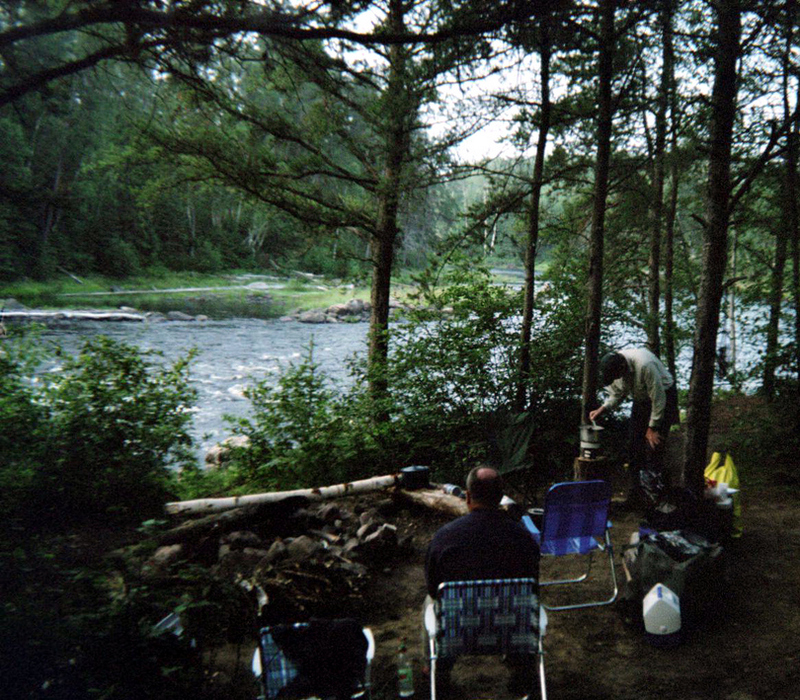 At this point we pretty much had the river to ourselves and saw no other canoeists. We pulled in on a high bank to camp for the night. The mosquitoes were pesky. Skip demonstrates how to sip a cold beverage through his bug netting. 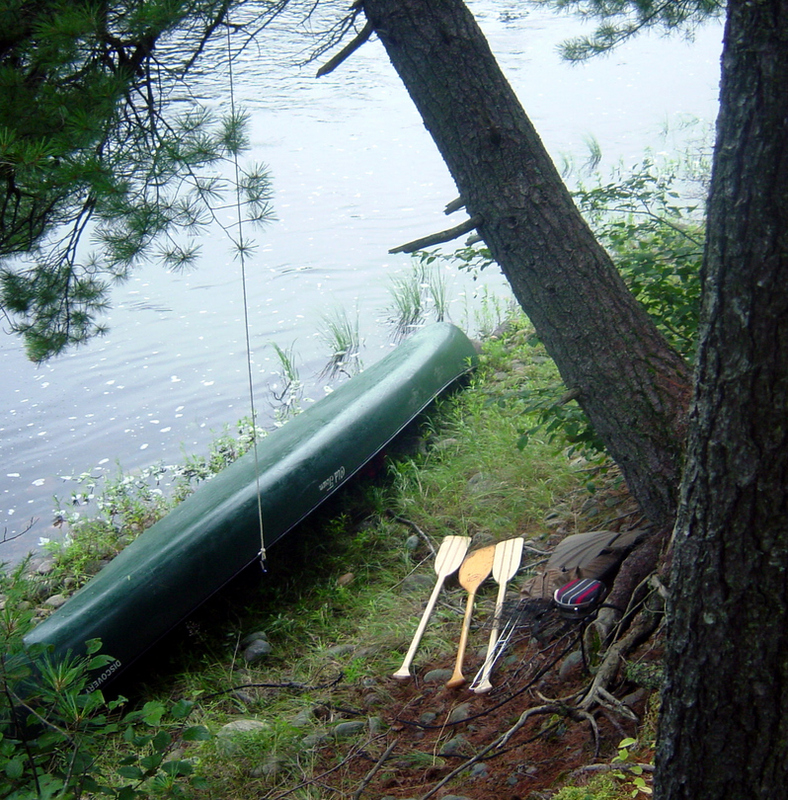 Canoes and gear in repose for the evening. As we progressed downstream the Spanish River picked up in volume and velocity. We moved through the lower stretches faster than anticipated. 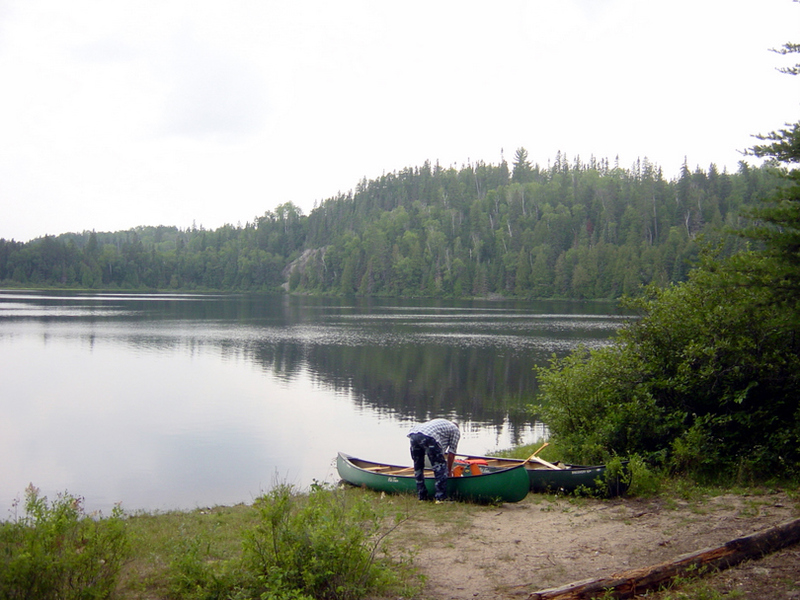 Our last day involved paddling across Lake Agnew to the lodge. Our fatigue was eased by Bob’s singing. Most notable was his rendition of Southern Cross by Crosby, Stills and Nash.